Newbury Dental Group > Blog > Uncategorized > What Are The Benefits of Dental Implants? Dental implants are used as a long-lasting solution to missing and broken teeth. Many people choose implants to restore confidence in their smile, as well as normal speech and eating capabilities. What is the process of installing implants? If you have missing or broken teeth, you may qualify for implants. Scheduling an appointment with the doctors at Newbury Dental Group to get an assessment of your teeth is the first step. Next, your dentist will take an impression of your mouth that will be used to create the implants. Your new teeth will match the size, shape, and color of surrounding teeth so it will be impossible to tell they are not your natural teeth. A metal post is then secured to the jawbone to create a durable root for the synthetic tooth to be attached to. If you have had dentures for several years or have a compromised jawbone due to other reasons, implants are still possible with a bone substitute if necessary. How do I take care of my new dental implants? 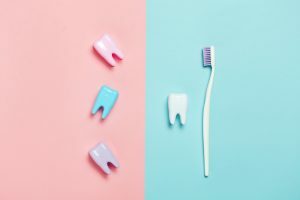 Dental implants will not get cavities like natural teeth, but you still need to practice a regular dental hygiene routine in order to keep your gums and the rest of your teeth in good health. You don’t have to worry about dental implants falling out during physical activities or average daily use like with dentures. They are safely secured in your mouth and can be treated like natural teeth. Along with daily flossing and brushing, you should schedule a dental cleaning and checkup twice a year to maintain your new smile. Newbury Dental Group is currently offering a discount for an implant, abutment, and crown for $1995. Please contact us at 805-410-1532 or sam.newburydentalgroup@gmail.com to set up an appointment with Dr. Peyman or Dr. Sam at our office in Newbury Park or Thousand Oaks.